They may not be as common as dogs and cats, but birds make very interesting and rewarding pets. 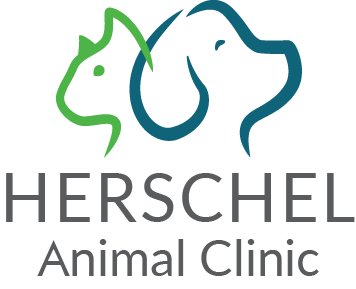 As with any animal, as a conscientious and compassionate owner it is your responsibility to make sure you are covering all aspects of your bird’s care, from her environment and nutrition to her grooming. Whether this is your first bird, or you are a more experienced aviary owner, there is always something new to learn or to refresh your memory about. To help you give your feathered friend the best life possible, here is our brief guide to basic pet bird care. It goes without saying that your bird will need to live predominantly in a cage. However, as with most pets it is important that you provide her with as much space as possible. This means buying the biggest cage you can afford and have space for. She should be able to flap her wings without hitting any of the sides and there should be at least 2/3 perches for her to fly between. There also needs to be room for plenty of toys and water and food dishes. Choose a cage that has bars that are too close together for her to get her head stuck between them and opt for one with a powder-coated finish since these are easier to clean and shouldn’t rust. Ensure it is secure and can be locked. Place her new habitat in a bright area of your home or yard, but not in direct sunlight. You should line the bottom of the cage with newspapers, paper towels or other plain cage line paper. These are the most sterile and are the easiest to remove on a daily basis when cleaning out her cage. Substrates like sand or wood chippings easily grow fungus and bacteria, which could lead to your bird becoming sick. A proper diet is essential for all species of animal including birds. The easiest way to feed your feathered pal is to use commercial formulated diets created specifically for pet birds. This ensures that she will get all of the nutrition she needs from one meal, rather than you trying to choose and balance foods. Many people mistakenly believe that birds should mainly eat nuts and seeds, but this is incorrect. Instead these should be occasional treats and not part of her regular diet. 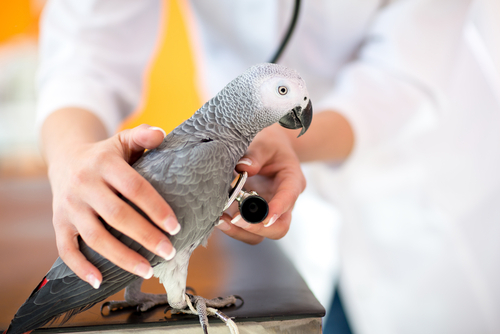 If your pet bird is unwell, your vet may recommend that she follows a very specific diet – ask your professional for more advice. Cleaning out your bird’s cage is essential if she is to remain healthy and happy. A daily cleaning of the cage floor and bowls is recommended. Check the paper as you replace it – any signs of blood might suggest that your bird is unwell. In addition to replacing the paper daily, you should also do a thorough clean of her cage using hot, soapy water at least once a week to keep it in optimum condition. Yes, bird grooming really is a ‘thing’ and it is important to keep your feathered friend looking and feeling great. Ideally you should bathe your birdie at least two times a week, either using a spray bottle or by setting up a bird bath in your sink or using a shallow bowl of water. After her bath, gently towel dry her and keep her in a warm room away from draughts. She may even enjoy a gentle blow-dry – just be sure to use a warm, not hot, setting and keep her a good 12 inches back from the dryer. If you have a parrot, you will find that her nails need to be clipped on a fairly regularly basis to prevent them from becoming too long. Parrots also need to have their wings clipped to prevent flight and keep her safe. Consult with your specialist avian veterinarian for these services. Mental stimulation is just as important for a bird as any other type of pet. Many are extremely intelligent and playful creatures, in particular parrots who are well-known for their curious and inquisitive nature. Provide a variety of toys to help keep her entertained – you can pick these up in any good pet store. You can even give her a piece of corn on the cob, or place leaves on or against the outside of the cage for her to peck at with her beak. 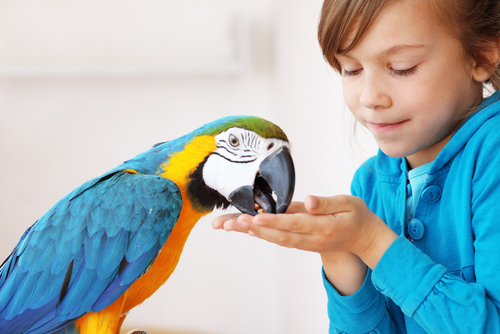 Human interaction is crucial too, and your bird will love spending time bonding and playing with you. Talk to her, take her out in a secure room and enjoy games together, encouraging her to return to you with a small treat. Make a fuss of her and ensure she knows how important she is to you and your family. If you are considering bringing a pet bird into your family and would like further advice and guidance before you do, our team has the experience and knowledge of avian care needed to help you offer your bird a safe, comfortable and happy home. Please don’t hesitate to get in touch.